These are a set of turbo pistons for MK5 2.5L Engines. They will work with stock rods but it is recommended to use one of our sets of H beams with them. They are made by JE and are the highest quality pistons you can get. They come complete with rings. wrist pins, and wire locks. This set yields 11:1 CR and is a .5mm overbore ensuring proper piston to wall clearance. Drop ins are available but not recommended. JE are a great upgrade for someone looking to build a stout, reliable engine. They have 20mm wrist pins so they will require a set of rods with 20mm pins to match. 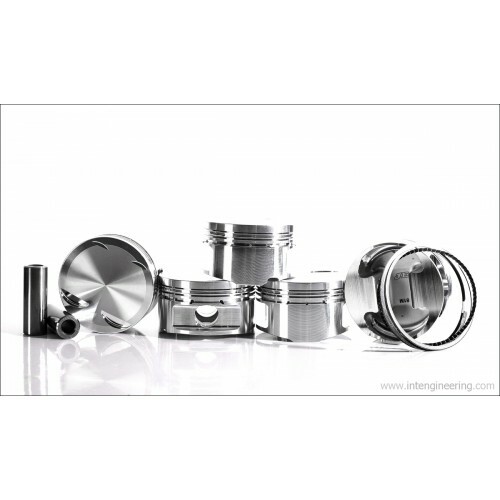 They feature JE's 2618 alloy which is stronger then most other pistons made from 4032, and are specifically engineered for extreme applications. Dish requires no deburring or preparation.